Ask fellow campers about "Big Fir Campground & RV Park" and nearby attractions. I arrived to stay the host was friendly as I arrived. Gave me directions to the site full of long term trailers very tight because of vehicles parked in the road. Got to site, it was a mud hole. Mud out side my door 3 inches deep plus a mud puddle 2 feet across and 3 inches deep full of water. No cable, ask about setting up my dish the manager was rude told me no. I had no tv at this park at all. There are many very large fir trees in the park that are dead, some day will blow down with a high wind, need to be removed asap. Was drawing 26 amp on the 50 amp service the circuit, was off when I returned after several hours. I ask the manager if electric was off he said no. I told him mine was off he told me it was my coach I told him I checked the coach. It is in the park the manager said I was using too much power. The manager went to the meter box site the turned the circuit on again. I looked it was not a 50 amp plus breaker on his panel box it looked like a 20 amp breaker from where I was standing. It is a place to stay if there is no place else. Positive is had good wifi and it was quiet at night, most folks went to work about 5 am, never bothered me. We camped at Big Fir Campground & RV Park in a Motorhome. This campground is in the country and good location to many things in this area. Lots of trees and full hook-up, BUT many of the sites are taken by what look to be full time people living here and not all of them are well kept, so kind of gives a unsettling feeling to me any way. There is room for some pretty large RVs here, and the nice ones are only here for short stay. Lots of trees, so that is nice. BUT the bathrooms are down right GROSS. I would not give my dog a bath in there. Sad they are making money and don't see a need to do something about cleaning up the bathrooms. It's a place to stay if you have things to do in this area, but make sure you have onboard what you need so you never have to go into the bathrooms. 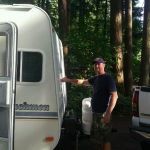 We camped at Big Fir Campground & RV Park in a Motorhome. Cute little park in the trees. Thirty seven sites. Lots filled with residents. Tight, but accessible for big rigs. NO SATELLITE reception. AT&T ok. Good water pressure. We spent a week here. The PPA rate was for four nights and the remaining three nights was full price. Total, $153 for the week. We camped at Big Fir Campground & RV Park in a Motorhome. Nice rustic campground if you want to get away from the feel of the city. No road or rail noises but a lot of dogs barking and some loud neighbors (it looked like many sites had 'residents' but most residents seemed to keep their sites in order). Gravel drives and pads. Lots of big trees and a separate area just for tents. Small grocery on site and charcoal bbq's at all the sites (no wood fires). We camped at Big Fir Campground & RV Park in a Motorhome. Are you affiliated with Big Fir Campground & RV Park ?